Bring the chicken stock to a simmer. In a large heavy sauce pan heat one ounce of butter, add the onion and sauté without browning until translucent. Add the rice to the onion and butter. 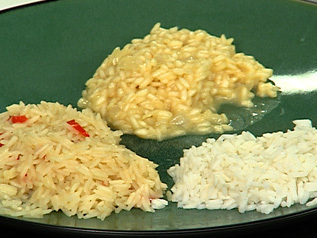 Stir well to coat the rice with the butter but do not allow the rice or onions to brown. Add the wine and stir until it is completely absorbed. Add the saffron; add the simmering stock four ounces at a time, stirring frequently. Wait until the stock is absorbed before adding the next four ounces. After approximately 18-20 minutes, all the stock should be incorporated and the rice should be tender. Remove from heat and stir in one ounce of butter and the grated cheese.